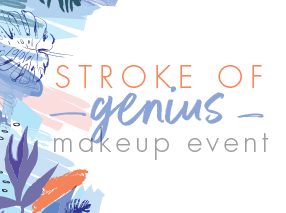 Go from “I get it” to “I’m a genius” with tips, techniques and tricks from bareMinerals experts. Your one-on-one session will be customized to your makeup goals. Pick a 20 minute spot to take your makeup game to the next level and explore great new tools from bareMinerals. Perfect for a mom & me outing just in time for Mother's Day, this event can be a great intro to makeup for young girls begging to start wearing makeup.This event is also a great opportunity to learn more about new makeup from bareMinerals. We want to help you put your best face forward and feel confident in your makeup skills no matter what level of mastery you are at. Your one-on-one session will be completely customized for you so you can get the most out of your time. Your session will be led by a bareMinerals trained makeup artist who will help you find the look that most accentuates your personality, lifestyle and goals. Exciting things are happening at Solutions! 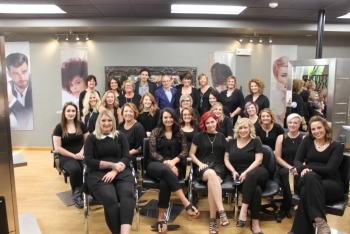 Our salon will be featured in an upcoming global marketing campaign for Keune International! You are probably familiar with the Keune brand, as we have featured their color line and products since 2012, but you may not realize that they serve salons in over 60 countries. Pretty cool! 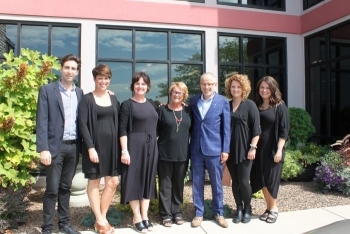 We recently had the amazing opportunity to host the George Keune Jr., President and CEO of Keune Haircosmetics North America right here in our salon. 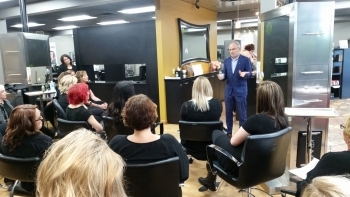 He toured our salon and spent time talking to our staff about the rich family history of Keune, their beliefs and mission and their products. He even asked our staff for feedback on their products and ideas for new additions to the Keune line. It was a day that really hit home the reasons we love the Keune brand so much. Keune is a family owned company and they operate with a personal touch that is incredibly hard to find, especially when talking about a global company serving so many different markets. They truly value building relationships with not only their distributors, but also the stylists and staff in the salons that carry their products. Keune also has a rich history of creating products that truly meet the needs of stylists and clients alike. We are very proud to partner with them to provide you with quality products you trust. On top of the honor of having George Keune Jr. visit us, we will welcome a production crew from the Netherlands to film in our salon. They will be filming the salon and our staff for the upcoming global marketing campaign for Keune International. The salon is buzzing with excitement and a bit of nervous energy. We can't wait to share the results with you. After all, we wouldn't be here without the support of our guests. So thank you for your continued support! Read more in the write up from the Kokomo Tribune. Summer is beginning to wind down and the signs that fall is on it’s way are just around the corner. Soon the scent of pumpkin spice will fill the air and we’ll be on the hunt for boots and scarves to make our favorite summer styles last just a little longer. The very best sign of fall’s arrival is our Annual Fall Special. 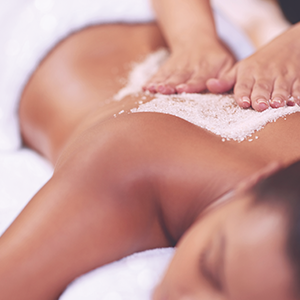 Treat yourself to 3 of the best spa services in town for just $99. You can save up to $100! Reserve your spot today! Our fall special is an amazing way to treat yourself or to spend some time with friends or co-workers. The Fall Special is a great opportunity to try out services you may have not yet experienced. We are so proud to offer amazing services performed by experienced and knowledgeable massage therapists, estheticians and nail technicians. Our therapeutic massage is a 60 minute full body massage based on the Swedish style. 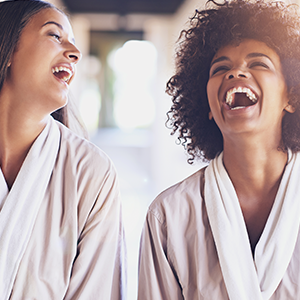 Not only is it great for relaxation, but it helps to increase circulation, relieves tension and anxiety and offers many other benefits. Your skin is a living, breathing thing that needs nurtured and tended to. We all long for that beautiful glow skin that we had when we were younger. Our Eminence Organic Facial includes a skin analysis by one of our expert estheticians. 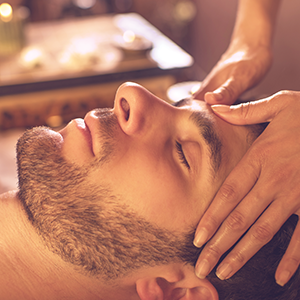 The relaxing facial is then customized to meet the needs of your skin and lifestyle. Fall is the ideal time to rejuvenate and refresh your skin. We have subjected our skin to the sun, heat, windy and humid conditions, and it can be dry, dull and damaged. A Body Polish is just the treatment to get your skin ready to go into the cooler months. Your therapist will gently massage a sugar scrub containing natural Alpha Hydroxy Acids to remove dry and dead skin cells to reveal a healthy glow. You'll enjoy a relaxing shower of water and indulge in a rich moisturizer to finish your service. Just because your stylish boots are calling your name, doesn't mean that you should skip a pedicure. Smooth, soft feet and healthy trim toenails are the way to go year round. Knowing that your feet are going to be covered for the next few months is all the more reason to treat your feet! Aside from pretty polish, there are many health benefits you can reap from pedicures. We can't wait to see you for your Fall Special! Give us a call to reserve your appointments today! Spaces will fill up fast.